Reaching approximately 400 families each year, Positive Parenting at Trinity is making a difference in the lives of children and their families. The outdoor classroom was constructed using pre-existing trees and a field. A number of natural materials and perennials were added to help define play areas while providing children with the opportunity to learn about plants and materials natural to their region of Iowa. The wide variety of flowers, grasses, and plants provide colors, shapes, sounds, and smells for the children to discover while ground cover provides different textures for the children to walk on, dig up and play in. Many species of birds are attracted to the new outdoor classroom. Separation of each space was achieved by including low growing grasses, recycled telephone poles, stone paths, a variety of ground coverings such as grass, mulch (chipped, shredded and bark), tree cookies, and pavers and a low berm. Separation of areas helps children to focus on the activity at hand and makes sure that one activity does not interfere with another. Storage sheds have been placed along the perimeter of the outdoor classroom. A local wood worker was hired to make wooden signs which have been etched with the name of each area. The boards were then stained, sealed and posted or hung in the correct areas. Laminated cards, with a detailed description and picture, are included in each area for visiting adults. Pathways were created throughout the space, which are in clear view of teachers, but allow children to feel hidden at the same time. Children may also get this feeling when they play with the large pieces of material in the deck and climbing area. The decks and raised gardens are constructed of Trex material. This means no splinters, low maintenance and easy to clean. Storage sheds, benches, and balance beams are constructed of cedar, a very durable and strong wood which only needs to be treated every other year. 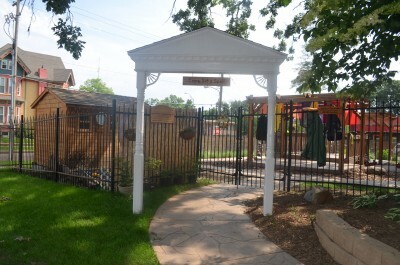 A partnership was made with the local parks department and local volunteers to help maintain the gardens. Each season the children thumb through magazines and select the fruits and vegetables that they want to plant in the gardens. River rock and drift wood, collected near the Mississippi River, have also been incorporated into the space.